CBS11’s early morning picture remains a work in progress but its new centerpiece is now in place. 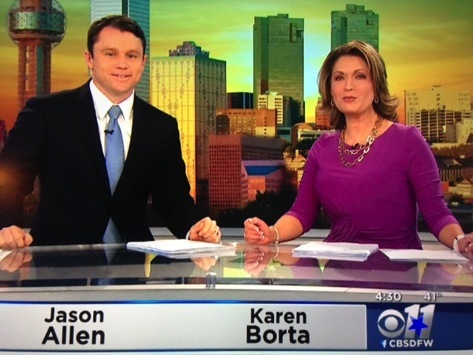 Veteran 6 and 10 p.m. anchor Karen Borta officially made the switch Monday, dawning bright and seemingly wide awake at 4:30 a.m. to minimal fanfare. CBS11 has never been better than fourth in the waker upper competition, running behind Fox4, NBC5 and Gannett8 in that order during the four-week November “sweeps” ratings. It’s a very important “daypart,” and has been for the last 15 years or so after decades of playing Siberia in the local newscast pecking order. Now only the 10 p.m. news is a bigger deal, and even that’s debatable. Any of D-FW’s four major TV news providers might well prefer being No. 1 from 4:30 to 7 a.m. instead of in late night. There are lots more hours in which to sell advertising time. And the potential audience is loaded with gainfully employed younger viewers who at least catch glimpses of their favorite A.M. local news before heading to the workplace, taking the kids to school -- or both. CBS11 confirms that its early morning foursome is still temporary. Both co-anchor Jason Allen and traffic reporter Tammy Dombeck have been deemed interim replacements while the station searches for “permanent” members of the team under relatively new news director Mike Garber. Borta succeeds anchor Adrienne Bankert, who also resigned. The only non-moving early morning part of late is meteorologist Scott Padgett, who joined CBS11 in September, 2013. CBS11 has mounted a major “Mornings Will Be Better with Borta!” campaign to herald her transition after nearly 20 years as a P.M. anchor. Below is the newest promo, which includes a collection of -- all together now -- Facebook raves.